The Nile Valley refers to the large region of land surrounding Africa's Nile River, including its watershed and adjacent regions. The Nile is not only the longest river in Africa, but the longest in the world (4,130 mi). Its two tributaries flow from south to north, with the White Nile beginning in the highlands of Central Africa's Great Lakes region, and the Blue Nile trickling down the even higher elevations of Ethiopia. The two converge at Khartoum in Central Sudan before penetrating the dry lowlands of the North. Archaeological evidence can trace the spread of modern human habitation from the southern end of the Nile Valley in Ethiopia some 195,000 years ago to as far north as modern-day Central Sudan by 70,000 BC. Archaeological evidence also suggests the Nile Valley was the primary migratory route for early modern humans out of Central Africa and into Western Asia, and the continuous inhabitation along the riverbanks eventually grew to a large, influential civilization. Some of the world's oldest remains of homo sapiens lie at Omo Kibish ("Omo Kibish-1" or "Kamoya's Hominid Site") on the southern edge of the Nile Valley near the modern Ethiopian-South Sudanese border. The earliest known sign of civilization in the region is a harpoon found along the Semliki River near Lake Albert. Several hundred miles downstream, Royal Ontario Museum researchers found an ancient tool workshop south of Dongola, Sudan with thousands of axes on rows of stones, dating back 70,000 years. Such mass production of tools suggests one of the world's oldest examples of commerce and industry (the construction of this site occurred prior to the time Africans began to migrate out of the continent). Another example of the mass-scale production of tools and grain collection can be found as far north as the Wadi Kubbaniya archaeological site near Aswan in southern Egypt (17,000-15,000 BC), which also suggests an early origin of agriculture. Near the beginning of the White Nile, near Lake Edward in the modern-day Democratic Republic of Congo, archaeologists discovered the world's oldest evidence of the use of mathematics, which dates to at least 20,000 BC. The so-called Ishango bone's inscriptions consist of two columns of odd numbers that add up to 60, with the left column containing prime numbers between 10 and 20, and the right column containing both added and subtracted numbers. The Nile Valley would much later introduce the world to more advanced algebra and trigonometry. Cultural developments can be traced north of the confluence of the White and Blue Nile in modern-day Sudan. At Jebel Sahaba, near Wadi Halfa (Cemetery 117), archaeologists have located the oldest known evidence of ceremonial burials (13,700 BC), a tradition which continued through Dynastic Kemet and even to today, and among the world's oldest pottery sheards. Because roughly 40% of the human remains exhibit signs of apparently fatal wounds, it is widely considered to be the oldest known example of human warfare. At the nearby Toshka Cemetery (13,000 BC), the human remains were buried in the fetal position as commonly found across Africa, and we find the oldest evidence of cattle worship, representing an early link to Dynastic Kemet's cow deity, Hathor. Further evidence of cattle worship, as well as domestication and sacrifice, can be found west of the Nile at Nabta Playa in the Nubian Desert (12,000 BC) west of Aswan. At the same site, one of the world's oldest stone calendars appears to track the summer solstice and was constructed at the beginning of the last alignment of three of the center stones with Orion's belt (6400 BC). 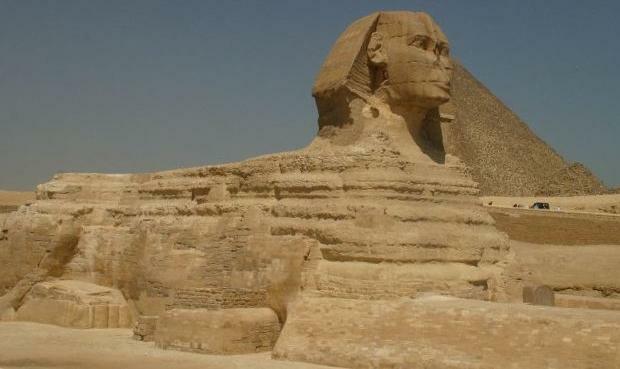 The deification of other animals and concepts is demonstrated with the the first known megalith, Horemakhet (often misnamed the "Great Sphinx"), constructed further down the Nile (7000-5000 BC). Despite the fact that there are 6 cataracts between the confluence of the two Niles and the Nile Delta, many of the cataracts are navigable during the flood season, contrary to popular belief. This gave rise to a maritime culture in the Lower Nile, in which large ships were perhaps used as early as 7000 BC to help facilitate the exchange of culture, knowledge, goods, and services. At that time, petroglyphs showing large ships were created at El-Salha, south of Omdurman, Sudan (7050-6820 BC).